In New Zealand, agriculture is a huge part of the economy — it contributes two-thirds of their exports and roughly 42% of the country is farmland. A major challenge this industry faces, and therefore the country, is the varying, sometimes harsh, weather conditions in each region. For example, on the west coast, it rains a lot; on the other side of the mountains, though, it can be very dry for much of the year; the north is typically hotter than the south; etc. These variations make it difficult for the government to objectively declare a drought, as each region will have its own thresholds. From 2014–2017, right before I began working with StormGeo, I lived in New Zealand and worked as a Climate Database Scientist for the National Institute for Water and Atmosphere (NIWA). During this time, my team received a proposal from the Ministry for Primary Industries to develop a system that would allow them to accurately declare droughts when necessary, taking each region’s climate into account. Officially declaring a drought is vital for farmers, as it allows them to get the governmental support they need during hard times. Drought is a difficult concept to define because there is no way to create a standard definition that applies everywhere. From a meteorological perspective, wind, humidity, temperature and rainfall all play a role, along with the typical conditions of a region. However, depending on the application, many other factors can be considered, such as socio-economic factors and human perception. 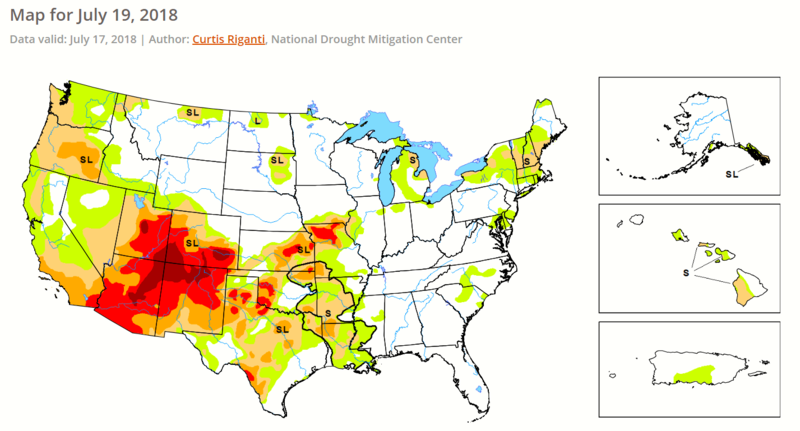 What one person would consider a drought, others (who may be more used to dry conditions) might not. In New Zealand, the most widely-used indicators of a drought relate to the typical plant-water cycle processes: precipitation, soil moisture and evapotranspiration. We began collecting data on these indicators and compared it to the large archive of historical weather data from the National Climate Archive of New Zealand (data that dates back to 1880). Using this large breadth of information, we managed to normalize the indices for different parts of the country. This normalization allowed us to use a single nation-wide drought threshold and ensure that certain “drought-like” conditions were not typical or seasonal for a specific area. Furthermore, it is important to note that in order to have a drought, all indicators need to be high, as each indicator is working with the others. For instance, having a low amount of rain is not enough to declare a drought if the soil remains moist from other sources. EU, Canada and China. An important difference between their systems and New Zealand’s is that while they have a team of meteorologists analyzing the conditions shown on their maps, our resources were a bit tighter. This led us to create a system that was more automated and in need of little interpretation. Additionally, different countries prefer different drought indicators. For example, the U.S. uses the Palmer Index, which calculates the amount of dryness based on recent precipitation and temperature. We relied on data from indicators that New Zealand farmers and the government would already be familiar with. The New Zealand Drought Index shows a map of the entire country with a logarithmic scale of drought for each area — zero indicating normal or wetter than normal, and higher numbers correlating to drier conditions. A new map is published every day. Currently, it is winter in New Zealand, which means very low chances of drought conditions. We also created an app that separates each indicator during an adjustable time period and in specific regions. 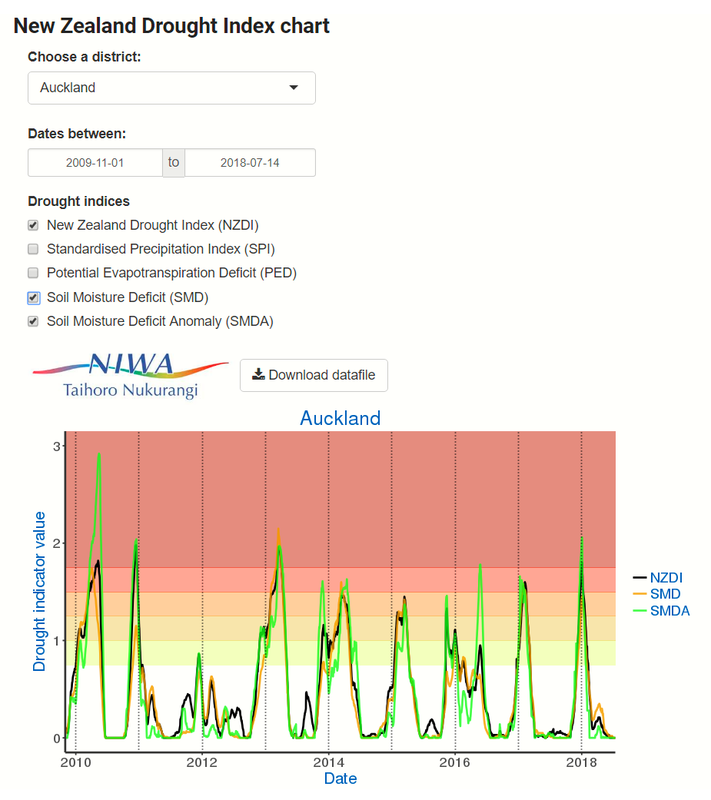 The chart to the right shows that over the past eight years, soil moisture in Auckland has had a direct correlation to the overall drought index. The Ministry now uses the New Zealand Drought Index as a key indicator when declaring a drought.